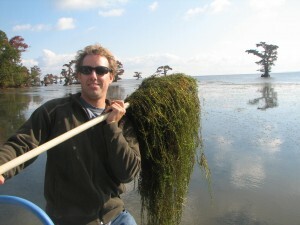 Invasive Hydrilla forms dense mats. Photo courtesy Rob Emens. Hydrilla verticillata is an aggressively invasive submersed aquatic plant that is not native to North Carolina. It grows fast and forms thick mats at the water’s surface. The plant outcompetes native vegetation, resulting in reduced natural biodiversity. Communities and agencies are increasingly concerned about Hydrilla in the Albemarle Sound and the surrounding rivers. The plant can negatively impact water-based recreation, recreational and commercial fishing, and local economies. Conditions in these water bodies do not appear to limit the plant’s spread and it is difficult to eradicate. Catching Hydrilla early enough in its spread allows for more efficient control and higher potential to protect coastal rivers and sounds. North Carolina Sea Grant is coordinating with other agencies and communities to improve our understanding of how Hydrilla is spreading in the Albemarle watershed. With our partners, we raise awareness and educate the public about the issue, and determine how to respond appropriately to maintain healthy coastal ecosystems. For more information, contact Gloria Putnam at gloria_putnam@ncsu.edu or 919-513-0117. Information on this site was adapted, with permission, from the Cornell University Cooperative Extension Program in Tompkins County.